Nobody knows mythic like Legendary Games, and whether it's new mythic feats, class abilities, path abilities, magic items, or anything else, every Mythic Mini delivers a delicious dollop of dazzling design that will fill out your mythic experience one slice at a time. Every Monday is now a Mythic Mini Monday, so check in with us each week for the latest product to make your game just a little more Legendary! So, to start out with, I want to say I've bought several of LG's PDF's. In general I've been very satisfied, or even impressed. So, each PDF is $1 ok, that's not so bad, right? Well, each PDF is also 1 page. Wait, what? 1 page? yep. Now yes, there's a cover, and some legal stuff, but you get exactly ONE PAGE for one dollar. So, lets say your favorite book is 400 pages, are you going to spend $400 to read it? Not me... Sadly I bought these (I got Guardian, Trickster, and Champion) around the same time, so I (foolishly) didn't read one before the other (again, I've had pretty good luck with LG stuff up to this point). Now, you say, yes, but if it's REALLY good stuff, that you just HAVE to have in you're campaign, surely that's not so bad.... right? Now, I know... It's only a dollar. But, for a dollar, for one one-sided page... really? The only other irksome thing is that the Champion book doesn't even have a 6th tier power... too bad there wasn't enough room... If only there was something they could have left out.... but oh well. As for the quality of the powers themselves. Meh. Most of them read like better-than-average feats as opposed to anything truly MYTHIC. They're not bad, and there are one or two that I'd consider taking, or even recommending to another player... but they're not must-haves, they're more like high-quality fillers for a tier when nothing else tickles your fancy. And if you're wondering, the answer is yes. I'm cut-n-pasting this review for all three books. Hey, if they can do it and charge me a dollar for it, why can't I review them that way... and I'm not even charging for it! Would I recommend it? Nope. -Analytical Eye: When a creature has attacked you, spend one use of mythic power as an immediate action to learn about int-mod combat feats your foes may have. That's...exceedingly boring and feels rather un- mythic, not starting with the metagamey aspects of the mechanics. -Combat Feat Mastery: Spend one use of mythic power, practice for one hours, get access to one combat feat for 24 hours. At 4th tier, instead get 1/2 mythic tier combat feats. At 6th tier, spend two uses for a training duration of only 1 minute per feat. This ability is insane, even for mythic power-levels - this essentially is not only a wildcard feat - it's potentially a wildcard feat-CHAIN. Not gonna happen in my game, even when going Mythic. -Smashmouth: 1 use of mythic power to accompany your bludgeoning damage allows you to penalize bite-attacks and verbal spellcasting. Very specific - why not make this work for all types of natural attacks, potentially with arms correlating to miss-chances for somatic components? This ability has potential, but should have more benefits/options. -Two Can Play at that Game: When learning of combat feats via analytical eye, you can spend one use of mythic power to be able to choose 1/2 mythic tier feats thus determined and gain access to them for 24 hours. Essentially a more limited additional way of getting feats - less OP that Combat Feat Mastery, but the requirement of a waste of a mythic path ability with analyzing eye mean I wouldn't choose that one either. The duplicated cover artwork eats about 1/3 of the space available for the content, which is something you should be aware of. Jason Nelson is a great designer...but I don't know what has happened here. I'm seriously stumped. Combat Feat Mastery is very powerful even by Mythic Adventures standards - to the point where many will yell "broken". Mythic Rider and Mariner are solid abilities, but all the others herein either are very specific, fall short of their potential or are downright lame. I would only take most of these under very specific circumstances and generally, was thoroughly disappointed by them. While not per se bad, many of the options herein feel bland - the mythic path equivalents of taking a skill-bonus increasing feat. With a bit more space and versatility, the Smashmouth ability could have been made awesome and more useful by expanding its focus. Honestly...I thought long and hard...and my final verdict will clock in at 2.5 stars, rounded down to 2. Why? Because I can only see my table ever using at best 1/4 of the content herein - the rest is simply off on one end or the other of the balance scale or simply not that interesting. Even Legendary Games seems to get it wrong once in a while. 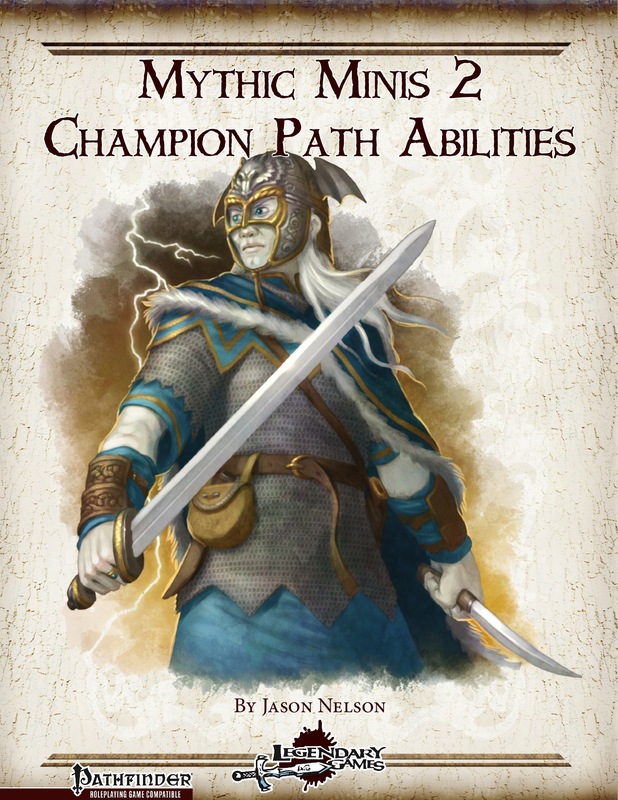 The second release in Legendary Games new Mythic Minis product line is an expansion of the Mythic Champions path abilities. I found each of the new abilities to be both flavorful and functional. Additionally each ability felt thematically appropriate for the Champion Path in its role as the premier mythic combat specialist. The abilities featured in this expansion are: Analytical Eye, Combat Feat Mastery, Smashmouth, Mythic Marine, Mythic Rider, Reaping the Chaff (my personal favorite), Trick Rider & Two Can Play At That Game (an advanced Analytical Eye ability). The layout is gorgeous. The rules are functional and thematically appropriate. The art is beautiful. And the price is simply Legendary. The bang-for-your-literal-buck is unbeatable. Grab yourself a copy today. Legendary Games has an excellent reputation and a great line of designers behind it, so let's look and see what this product has to offer! So, I was really looking forward to diving into this product. At one page, I was immediately reminded of Rogue Genius Games' bullet point line. Short, sweet, and inexpensive. That said, the path abilities in this product are underwhelming. Sitting at eight abilities in all, there is nothing here that feels mythic, and there are a couple that appear to be in direct violation of the inherent 'balance' of Mythic Adventures. I'm going to specifically call out Combat Feat Mastery, which lets you spend Mythic Power to gain a handful of Mythic Abilities whenever you want. It is essentially a Mythic version of the Martial Maneuvers core class feature of the recent Advanced Class Guide playest's Brawler class. For what you get, this Path ability quickly grows to outshine the Versatility universal path ability by 10th tier. Smashmouth, on the other hand, has the opposite problem. I like the concept of this Path ability, but it is too specific; it essentially causes your attacks against the target to penalize an opponent's bite attack. Why wasn't this expanded to allow you weaken any type of natural attack and called "Limbwrecker" or something along those lines instead? Reaping the Chaff is a very confusing read and has a very limiting focus; it can only be used against opponents whose Hit Dice do not exceed your Tier. That means my Legendary Hero can't use it on anything about 10th Level. Overall, these Path abilities are uninteresting at best and cheesy at their worst. 1 / 5 Stars. Mythic Minis are not about exposition, philosophy, and campaign-building; they are just ﬂat-out fantastic ideas and great mechanics for GMs and players alike, written by the same designers that helped create the oﬃcial mythic rules. That about sums it up, except I didn't find these path abilities all that fantastic, as you just read. Star rating isn't applicable. After saying all of the above, I will comment that the layout on this product is *gorgeous. The only other Legendary Games product that I own is Ultimate Rulership, and this product's layout and design is much better than the aforementioned product's layout. The text is TINY, however, and I was straining to read it. They also reused the cover art on the interior page too; I'm sure it wasn't intended to fill up space, but that's the first thing I thought after I did a double take. Its cool to reuse art across multiple products, but twice in the same product? Not cool. 4 / 5 Stars. I wasn't a fan of this product. The path abilities mostly revolve around granting the champion temporary bonus feats, which doesn't fit into Mythic Adventures. There is a precedent for this sort of power that clearly wasn't followed and it is clear that the author didn't follow Paizo's Advanced Class Guide playtest when designing this product; even if the Brawler doesn't exist as a class now, as-written this would be like making a better version of Smite Evil a Champion path ability that anyone could select. The focus on feats and the lack of ingenuity was noticeable and I won't be showing this product to my players, if only because these path abilities can't stand up with the existing ones in terms of coolness. If it comes between any of these path abilities and Aerial Assault, you can bet that I'm going to pick the path ability that lets me charge my opponent through the sky and send them spiraling into the dirt face-first. Every. Time. Merry Mythic Monday! Come and get it! Thanks to both Alex and Weslocke for taking the time to review the product and sharing your thoughts. Alex, sorry you didn't care for this one (though I'm glad you enjoyed the Aerial Assault ability I wrote for the Mythic Adventures hardback), but hopefully you'll give one of our other Mythic Minis a look and see if that one strikes your fancy. In fact, since I wouldn't want you to leave disappointed with your purchase, if you'd like to sample one of our other Mythic Minis for free send me an email at makeyourgamelegendary@gmail.com and we'll make it happen. Thanks for the review Endy! Sorry you didn't care for this supplement but hopefully you'll love the next one. Philosophically, I like the idea of "wild card" abilities for martial characters. It seems only fair from a gamist perspective, given that spellcasters have always had the option to reshuffle their capabilities from day to day, that martials should have the same ability. That is a bit metagamey, it's true, but I think it's a rational concept from a simulationist perspective as well. A cleric or wizard studies, prays, and otherwise devotes themselves to learning a great variety of potential abilities, though on any given day they practice or refresh only a handful of the things they are capable of doing, enough to make them happen in a game-mechanical sense. Today I brush up on my teleporting or my curing or my fireball-making or my summoning. Tomorrow I might focus my preparation on controlling the weather or changing things into different forms or creating stuff out of nothing. A fighter likewise learns all kinds of skills in the course of their training and practices tricks bit by bit, while figuring out how to use a trick with first this weapon and then transferring it to that. If he's planning to go riding, he'll practice his riding tricks. If he finds a new weapon or shield or suit of armor, he prepares himself to use his new tools to their best effect. The concept simply recasts the martial classes (if they take these kinds of mythic path abilities) as masters of fighting, adaptable and deadly, rather than being locked into one build for their whole career. Taking a path ability like this makes a martial character more like a wizard or cleric rather than a sorcerer or bard, who learns only relatively few tricks and is stuck with those for their whole career (retraining aside). That said, reasonable people differ on what martial characters ought to be able to do, especially in comparison to other kinds of characters. As I mentioned above, hope you enjoy the next Legendary product in the queue! I actually LIKE Wildcard-feats/feat-chains as an idea - in fact, since my home-game uses different racial stats for different ethnicities, I actually have quite an array of experiences with one-wildcard-feat-characters. I don't object to the idea of a wildcard-feat, but rather to the potential to modify whole feat-chains. And yes, I see the same issue with Ultimate Versatility in MA. I just think that the idea eclipses the others by quite a stretch, offering essentially a fighter's ultimate versatility. While I consider both exceedingly powerful, I don't think they eclipse one another, though their synergy is the stuff of nightmares I do think, however, that both ought to perhaps be a higher tier. That being said, I probably should have made that clearer in the review. Had the other abilities been more interesting/versatile, I would have rated this much, much higher.